Laryngeal carcinoma is rarely associated with paraneoplastic syndrome. 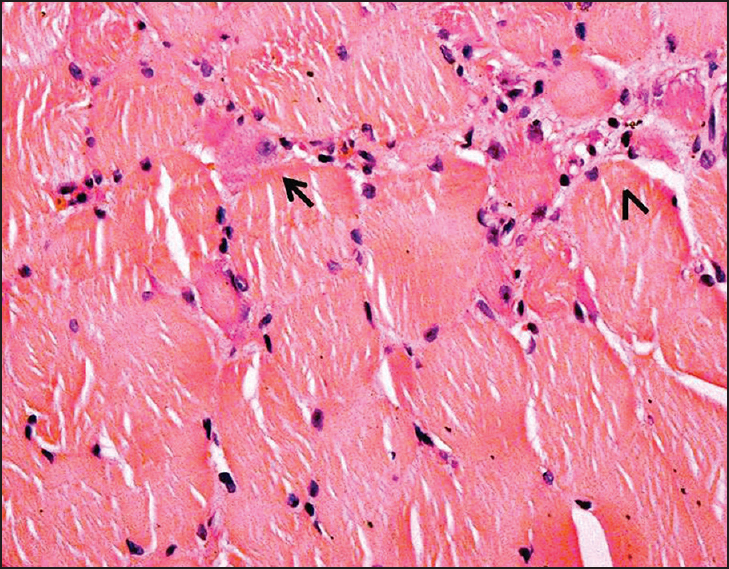 Inflammatory myopathy presenting as paraneoplastic event is commonly associated with carcinomas of ovary, lung, pancreas, stomach, colorectal, and non-Hodgkin's lymphoma. We report a case of elderly male, who presented with proximal muscle weakness and found to be associated with laryngeal carcinoma. Diagnosis of polymyositis (PM) was confirmed based on clinical features, laboratory test, and muscle biopsy. Exclusion of other commonly associated malignancies was done. This patient improved gradually after 6 months of immunosuppressive therapy and management of underlying cancer. Polymyositis (PM) is an idiopathic inflammatory myopathy and linked with cancer, but less frequent than dermatomyositis (DM). Both conditions usually present with proximal, symmetric muscle weakness. Clinical features along with raised creatine phosphokinase (CPK) and muscle biopsy are required for diagnosis. Here, we report an unusual association of PM as a paraneoplastic event in a patient with laryngeal carcinoma. A 54-year-old male was admitted to our hospital with 2 months duration of myalgia and body pain with progressive difficulty in climbing upstairs, rising from chair, combing his hair, and lifting both arms above head. Later on he became bedbound. He denied any history of sensory complaints. He had no fever, rash, arthralgia or arthritis, cough, dyspnea, or abdominal complaints. However, he also developed hoarseness of voice for last 2 weeks. Vitals were stable. There were no skin lesions or lymphadenopathy. Higher mental functions and cranial nerve examinations were normal. Motor examination revealed hypotonia and muscle strength was grade 3/5 in both upper and lower extremities confined to proximal muscle groups. Reflexes and sensory examinations were normal. Past history was unremarkable. Routine laboratory investigations including hemogram, leukocyte count, blood sugar, serum calcium, phosphorus and other electrolytes and renal and liver function tests were normal. Thyroid, parathyroid, and vitamin D assay were within normal limit. Antinuclear antibodies, myositis-specific antibody anti-Jo-1, and extractable nuclear antigens (ENAs) were negative. Specific investigations like CPK level was highly raised (9,136.0 U/L). Patient subjected to needle electromyography (EMG) of proximal muscles showed myopathic changes like short duration, low amplitude, and polyphasic potentials. We performed an open biopsy of right quadriceps. Histopathology showed perimysial and endomysial chronic inflammatory infiltrate and myophagocytosis [Figure 1]. Patient also underwent direct laryngoscopy, which revealed a laryngeal growth. Histopathological examination of laryngeal mass was suggestive of squamous cell carcinoma. He was evaluated for other associated common malignancies with serum prostate-specific antigen, chest X-ray, and computed tomography of abdomen, which were found to be normal. Bone scan was done and revealed diffuse muscle uptake in proximal groups suggestive of myositis. The patient was referred to oncosurgeon and managed with total laryngectomy followed by radiotherapy. He was also started on oral prednisone 0.5 mg/kg/day and azathioprine 2 mg/kg/day along with calcium and vitamin D supplementation. Periodic power charting was done to assess the improvement of muscle strength. On follow-up, he had regained almost normal muscle strength with complete normalization of CPK level after 6 months. Prednisone was tapered off slowly, while continuing the same dose of azathioprine. PM and DM are inflammatory myopathies of unknown etiology. DM is commonly associated with characteristic skin changes. Inflammatory myopathy as a paraneoplastic syndrome had been well described in literature and DM is more commonly associated with carcinoma than PM. , According to data reported by Hill and colleagues, about 30% of DM and 15% of PM patients were found to be associated with cancer, with approximately 60% of malignancies diagnosed after the diagnosis of myopathy. Majority of cancers were detected within 1 year of presentation of myositis and most common type of associated cancer was adenocarcinoma. The commonly associated carcinomas observed in previous studies were ovarian, lung, cervical, pancreatic, stomach, colorectal and non-Hodgkin's lymphoma. ,, To the best of our knowledge, this is the first case of laryngeal carcinoma presenting as PM, a paraneoplastic event. The laryngeal carcinoma is commonly reported to present with paraneoplastic cerebellar ataxia,  Eaton-Lambert syndrome,  anti-Hu positive encephalomyelitis,  and acrokeratosis paraneoplastica. Our patient presented with symmetrical proximal muscle weakness, which was found to be PM on muscle biopsy. Laryngoscopy and histopathology revealed squamous cell carcinoma of larynx. The pathophysiological mechanism of myositis in paraneoplastic syndrome is probably due to expression of myositis-specific autoantigen in cancer and affected tissues. Molecular mimicry leads to development of myositis as a paraneoplastic syndrome. Paraneoplastic syndrome like myositis can occur before, at the time of, or after the diagnosis of cancer with a majority of cases diagnosed within the 2-year period before and after the development of myositis. There is significant uncertainty in making the diagnosis of paraneoplastic neurological syndrome before the cancer development. In this case, presence of positive onconeural antibodies with neurological syndrome is categorized as definite paraneoplastic syndrome. However, presence of tumor along with improvement of paraneoplastic neurological syndrome with cancer therapy without concomitant immunosuppressive treatment in the absence of onconeural antibodies is also considered as definite paraneoplastic syndrome as per diagnostic criteria. In our patient, laryngeal cancer was detected within 3 months of onset of paraneoplastic event and he had recovered with anticancer therapy along with immunosuppressive treatment suggestive of possible paraneoplastic syndrome. Onconeural antibodies assay was not done because of financial constraints. Diagnosis and management of underlying cancer along with immunotherapy in early possible stage, in patients with suspected paraneoplastic syndrome may hasten the recovery of that event. Therefore; such patients may require extensive work-up to detect underlying malignancy, especially if common associated cancer has been ruled out. This report helps the treating physician to be aware of doing laryngoscopy to look for laryngeal malignancy, in patients presenting with suspected paraneoplastic neurological manifestation. Zahr ZA, Baer AN. Malignancy in myositis. Curr Rheumatol Rep 2011;13:208-15. Chen YJ, Wu CY, Huang YL, Wang CB, Shen JL, Chang YT. Cancer risks of dermatomyositis and polymyositis: A nationwide cohort study in Taiwan. Arthritis Res Ther 2010;12:R70. Hill CL, Zhang Y, Sigurgeirsson B, Pukkala E, Mellemkjaer L, Airio A, et al. Frequency of specific cancer types in dermatomyositis and polymyositis: A population-based study. Lancet 2001;357:96-100. García FJ, Blázquez JA, Pérez-Moro E, Martínez S. Paraneoplastic ataxia due to laryngeal carcinoma. Acta Otorrinolaringol Esp 1998;49:414-5. Medina JE, Moran M, Goepfert H. Oat cell carcinoma of the larynx and Eaton-Lambert syndrome. Arch Otolaryngol 1984;110:123-6. Baijens LW, Manni JJ. Paraneoplastic syndromes in patients with primary malignancies of the head and neck. Four cases and a review of the literature. Eur Arch Otorhinolaryngol 2006;263:32-6. Aksu G, Karadeniz A. Cutaneous paraneoplastic syndrome (acrokeratosis paraneoplastica) preceding squamous cell carcinoma of the glottic larynx. N Z Med J 2006;119:U2006. Levine SM. Cancer and myositis: New insights into an old association. Curr Opin Rheumatol 2006;18:620-4. Graus F, Delattre JY, Antoine JC, Dalmau J, Giometto B, Grisold W, et al. Recommended diagnostic criteria for paraneoplastic neurological syndromes. J Neurol Neurosurg Psychiatry 2004;75:1135-40. Kannoth S. Paraneoplastic neurologic syndrome: A practical approach. Ann Indian Acad Neurol 2012;15:6-12.